POSTALLOY® PS-98 is a metal-cored, triple deoxidized, iron base hardfacing matrix wire, alloyed with chromium and molybdenum. 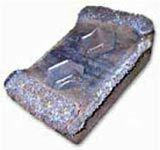 It is primarily used as a matrix alloy for the MIG Carbide Embedding Process and will consistently provide an even distribution of carbide particles throughout the entire weld deposit. Hardness range is 55-60 HRC. Unlike soft metal steel welding wires which are commonly used with the MIG Carbide Embedding Process, the high hardness tool steel microstructure of POSTALLOY® PS-98 is designed to encapsulate and protect the carbide particles from premature erosion. Tungsten Carbide Carbide Embedding (Mig Carbide). Metal cored triple deoxidized Iron based wire, alloyed with Chromium and Molybdenum.